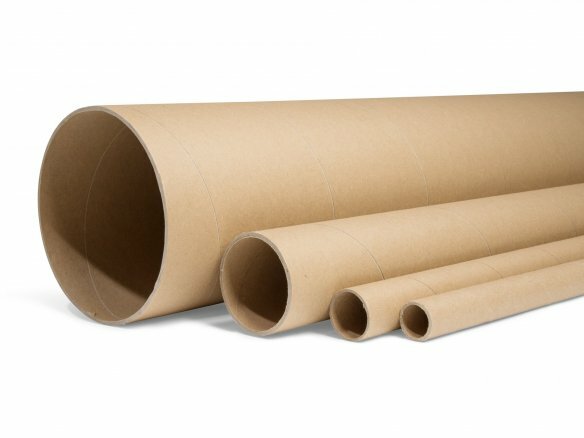 Laminated paper tubes can be found being used as winding centres, display tubes, construction tubes, distance pieces as well as wine shelves, table legs, etc, etc. Testliner and kraftliner are commonly used as coverings. The thin tubes with diameters between 22 and 30 mm are very suitable for being used as edge protectors or, alternatively, as frames for presentation boards or the like. When used for framing, a slit should be cut lengthwise in the tube with a circular table saw, then mitre cut and then pressed onto the edges of the panel or board. In doing this mounting work it is advisable that the slit size is less than that of the board’s thickness so that the tube can must be pressed into place and will therefore hold. Conjoining tubes with the same diameters should be done in the following manner: saw a ring from one tube and then cut a piece out of the ring so you can squeeze it together and fit it within the two tubes to be connected where it will expand and hold firm. Prass caps for round laminated paper tubes are not included in the scope of delivery and can be ordered separately. Please note that we can only ship this article larger than a diameter of 400 mm per forwarding agency which means that there are higher shipping and handling costs.